If you’ve listened to the Gamer Horizon Podcast and The Social Link Podcast, you know that I’ve praised and admired The Room since it first came out on iPad. In case you don’t know or even heard of it, The Room is a horror/mystery themed puzzle game designed by Fireproof Games, a studio whose staff has prior affiliations with Criterion, Media Molecule, and Bizarre Creations. Its Lovecraftian motif, coupled with its delightfully devious and devilish puzzles, easily puts the game on the top of my list of best mobile games of all time. Early this year the company released The Room 2 and, more recently, they’ve ventured into new territory with the Steam release of The Room. We had an opportunity to chat with Barry Meade, a co-founder and director at Fireproof Games, and talked about The Room’s early beginnings to the studios’ plans for the future. Please introduce yourself and your role in the studio. I’m Barry Meade, a co-founder and director at Fireproof Games, and my main job is to represent the company in all things public and private. How did Fireproof Games start? How big is the team in the original iOS release compared to the Steam release? Firepoof started in late 2008 as a 6-person art team doing contract work for various games companies. We had previously worked at Criterion Games from 2003-2008 where we were lead artists on Burnout 3, Burnout Revenge and Burnout Paradise, as well as working on BLACK. Over the years since 2008 we slowly added a few more artists to the team until finally in 2012 we hired our first programmer, Rob, and immediately set to creating a game for mobile devices. In 2012 the team for The Room was only 2 permanent people – Rob on code and Mark doing design. Over the course of 8 months a few more of us jumped in to help but more than 50% of the game was built by Rob and Mark alone. By contrast The Room PC had up to eight people working on it full time for 6-7 months. The Steam release was a lot more work and cost quite a bit more money to make than the original. What studios and kinds of games did the team work on prior to The Room? How did this experience contribute to the development of the title? What was the initial concept and/or inspirations behind The Room? Was it always going to be a puzzle game? And if so, was there a conscious effort to have The Room to be rendered as realistic as it is? The early concept that Mark had was to build a sort of Chinese puzzle box-type object to play with using the touch screen on mobile devices. We felt that would really lend itself to the touch interface and had noticed how well games such as Zen Bound had made tactility a big part of the experience. Secondly, we had a boat load of artists and only one coder which meant we needed an idea straightforward enough for Rob to code on his own, but pretty enough that multiple artists could let loose their talent on the visuals. Thirdly the horror aspect came about because for years we had wanted to make a proper horror adventure game on PC/console – so we turned to mobile it seemed natural to draw on our interests. So really, if you add it up The Room became into existence for fairly practical reasons. What were the challenges you faced when developing The Room on the iPad? There were many small challenges such how to make the touch interface work really well, overcoming puzzle designs that were too easy or hard, finishing everything in time for release, and I’m sure there were coding issues Rob could tell you about. But even to crow about the challenges seems silly as they were basically trivial. Keep in mind that we’d all come from the insanity of huge budget, huge team AAA development on console/PC and so to us making a mobile game on our own was an ocean of calm and creative autonomy. Because we had no publisher or investors, we could make what we wanted and there’s something uniquely satisfying about making your own game for yourself. Looking back I think we would all agree The Room was the most pleasant game development any of us had ever worked on up until that point. 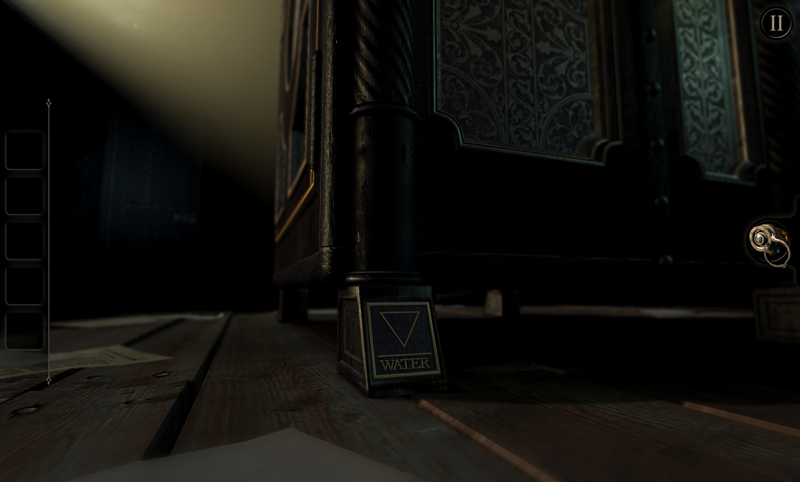 Whoever designed the puzzle boxes in The Room is a devious, devious person! The idea of boxes that transform into various different designs tickles my mechanical fancy. 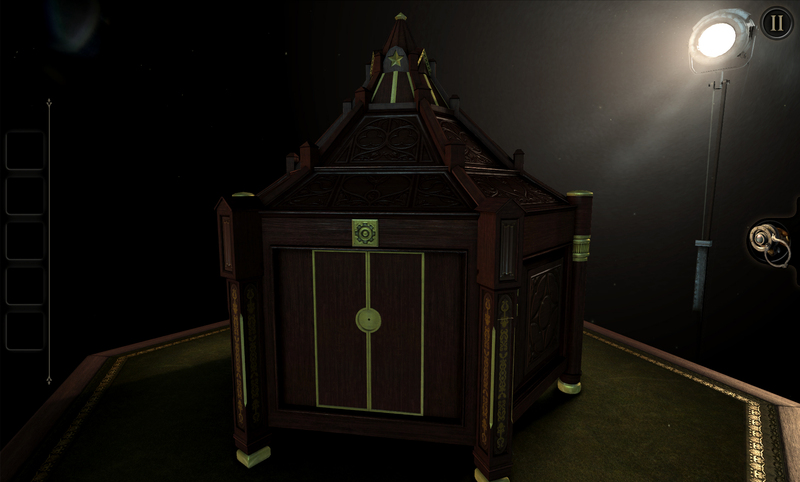 How did you go about designing each of the puzzle boxes? They seem to be so integrated with each other that it’s almost unfathomable to comprehend from a game/level design standpoint. Mark actually had lots of basic ideas for puzzles, and if the simple versions of them worked he would just run with it & build upon them, making them into the more complicated versions you see in the final game. We were all playing the game a lot and so suggestions were not hard to come by. Rather than stick to a plan, we basically made the game up every day during development which I think is crucial for a game like The Room. Because how can you know on paper what an idea will feel like in software? When we started in February 2012 we had no idea what the game would look like, or be named, upon release in September 2012, we just trusted in ourselves that whatever it was it wouldn’t be rubbish! There have been many unsettling moments in The Room for me that, instead of making me stop playing the game, compelled me to continue investigating the mystery even further. Were there any ideas that were cut from the game that you felt were too unsettling that maybe the team thought would’ve had people drop their tablets on the floor in fear (or shock)? Not really, we made a few choices early on that helped us avoid that stuff. First, we didn’t want to make an outright horror game per se but rather a horror-tinged game – a chiller, something creepy. That meant no gore or other tropes of the usual horror stuff. Secondly we didn’t want to go for too many cheap thrills, by that I mean no jump-scares, sudden blaring noises etc. We wanted the game to be experienced at a chilled pace but be unsettling, moody rather than trying to terrify anyone. Any even that mild game we made was too much for some – a few religious players actually thought the game was somehow satanic, that the themes and words and symbology were biblical when in fact we made the entire thing up – down to the last symbol – in order to avoid that happening. The sound design in The Room is probably one of the best in mobile platforms, and that’s saying a lot. There were times when I’d put on my headphones when I would hear voices in my head and actually thought they were in my head! What was the idea behind the audio design? In keeping with the chilly atmosphere, we wanted the sound scape to match the gameplay and the visuals. I.e. 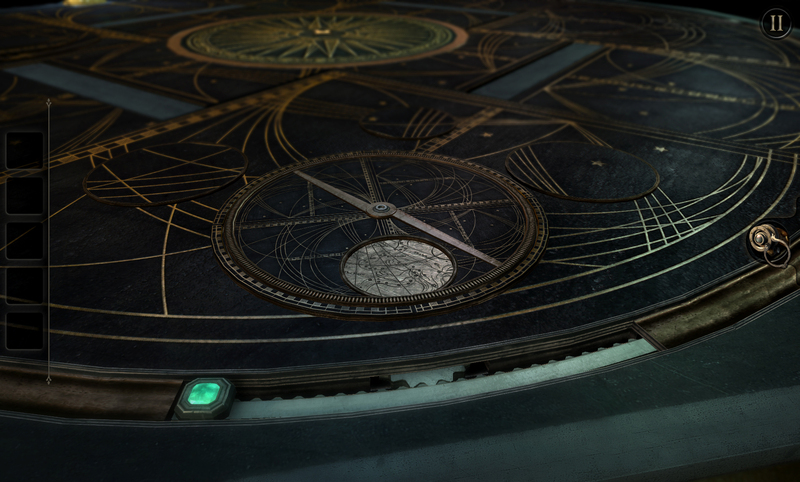 no overt horror-tastic music or SFX, we wanted to keep it ambient with nothing spelled out too much for the player. We wanted them to think exactly what you did: Did I just hear the sound of chains? Or did I think I heard the sound of chains? We didn’t want the player ever really to know what was going on – that way we could suggest ideas through small audio or visual cues that would set their mind racing. Because The Room has such a mystery around it, along with a narrative that just beckons players to dig deeper, some have proclaimed The Room to be an adventure game. Do you consider The Room as an adventure game or a puzzle game, and why is that? It’s a type of adventure game sure, though not in the strictly traditional sense. Whatever journey we sent the player on, it was mostly in the players mind – the gameplay mechanics were definitely puzzle-focused more than any other genre. I think because we put a lot of effort into the atmosphere, it made folks enjoy the otherwise simple game-world a lot more. But I would say its an adventure-light game too. Did you expect The Room to receive such widespread acclaim when it was released? What do you think were the contributing factors as to why players latched onto the idea so easily? We just didn’t know. We hoped beyond hope that we would sell enough to make its money back, and our big goal was to sell enough to fund a sequel. When the game went to #1 in the US & UK in 24 hours we were dumbstruck. Honestly, it knocked us out for days and weeks afterwards, and in some ways we are still recovering from that success! When was the decision to release The Room on Steam made, and how did you come upon that decision? In theory we’ve always wanted to make games for Steam because its such a natural home for gamers such as us. So as soon as The Room was a hit I’m sure we began talking about it in theory, but we left it a long time to happen as we knew it would cost a lot of time and money to do the PC version justice. And we were right – it has taken a lot to get it out finally. However we are happy and proud of the job we did and that’s all we can ask of ourselves. Earlier this year, you released the sequel to The Room, which also received critical acclaim. Were there any lessons you learned from developing The Room 2 that you applied to the development of the Steam version of The Room? Not really, other than we would have had a years worth of positive feedback from players and I’m sure that helped us feel more secure in what we were doing. We’ve always heard from developers that developing games on PC platforms are more challenging due to the variety of types of hardware you have to deal with. How was the experience of bringing The Room to Steam? That is true – it does take a lot more to do a PC version than, say, a version for IOS. But those same problems of Hardware/OS spread are present in the Android version, so its not like mobile is all easy. I have to say we didn’t run into any major problems making it for PC as such, it was more the content – the PC version is so much more heavy in terms of graphics that we basically had to restart making the game again. What would you say are the essential differences between the mobile versions and the Steam version of The Room? 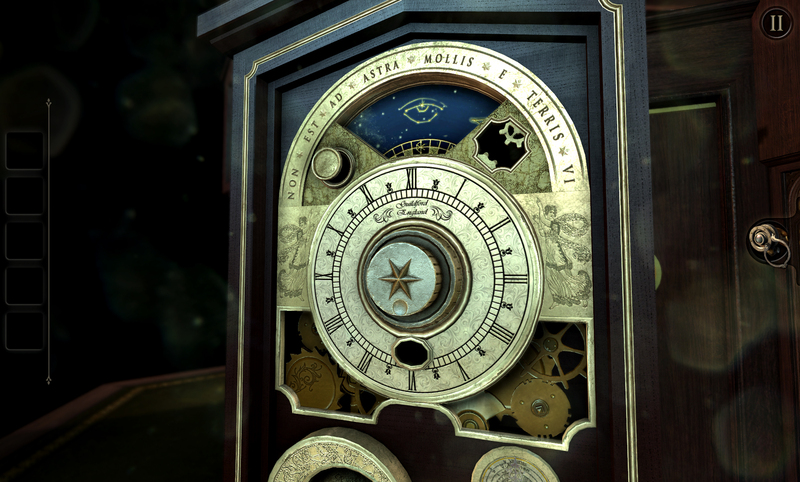 All of the puzzles that involved tilting the device are reworked or redesigned, as are a couple of others that relied too heavily on a touch interface too use, but broadly its exactly the same game but it feels and looks much more impressive for the PC. Now that the studio has brought The Room to Steam, does this experience give you any ideas for a Steam exclusive version of The Room, like perhaps a side story or a completely separate game? We love PC and console platforms and would very much like to do something original for them one day. As for what that might be I have no idea but it remains a goal of ours as bunch of fanboy gamers. Have you ever considered a console release for The Room (i.e. PS4, Xbox One, Wii U)? Well if we have it was only briefly! Touch-based platforms like Vita and Wii U could support a great version of The Room in theory. But the practicalities are rather different – Wii U’s pad is quite low resolution and the Vita is struggling to find a committed player base. However in theory we’re open to doing something on any platform but as a small studio we have a lot of stuff to get on with ourselves and would rather progress our new games than do ports. What are your plans for the future of The Room series? Lastly, will we ever get out of The Room? 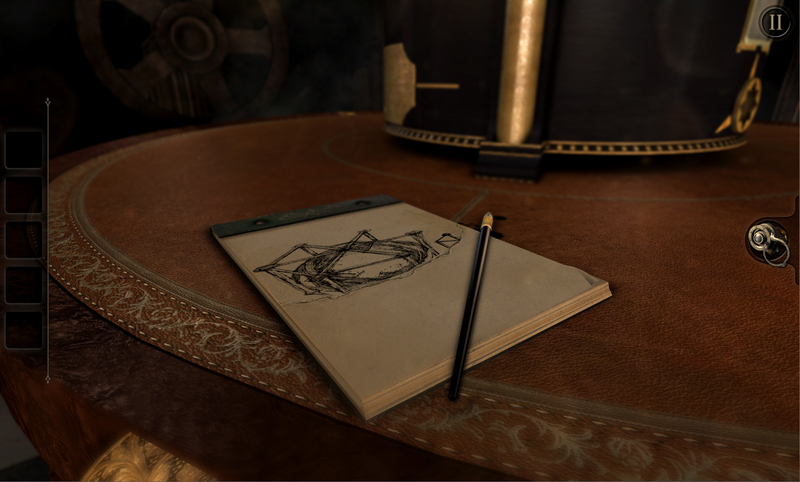 The Room is available on Steam, iOS, and Android platforms. If you’ve played it, let us know what you think in the comments below!